West Windsor, N.J. – On several dates in May, American Honors at Mercer County Community College (MCCC) hosted orientation sessions for students who have been accepted into the American Honors program, which begins this fall. The events gave students an opportunity to learn more about the program, meet other students and sign their Intent to Enroll. Topics for the informative sessions included how classes are organized; what is expected of students; transfer, including partnerships with four-year colleges and recent acceptances by American Honors students at other participating schools; an opportunity to meet Mercer's Honors advisor and plan next steps; and discussion of creating an Honors community at Mercer. According to Program Director Alyson Krawchuk, a number of the students are already enrolled in Mercer's existing Honors Program, while others are incoming freshmen. 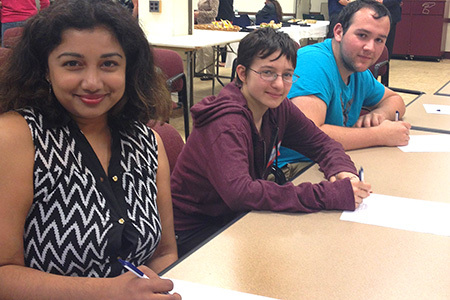 Left to right: Current MCCC Honors Program students Suleka Stieber, Natalia Barker and Ryan Gunthner sign up for American Honors, which will begin at Mercer in the fall. Mercer is one of two community colleges in New Jersey to offer American Honors. American Honors is a groundbreaking new initiative offered at select community colleges across the country. While academic rigor is the hallmark of every honors program, American Honors at Mercer also helps students establish a peer community and provides a level of support and guidance as students plan for transfer. The program builds on the highly successful Honors Program already in place at Mercer. This year, Honors graduates were accepted for transfer to Columbia, Middlebury, Mt. Holyoke, and Swarthmore, among many other colleges. More information about American Honorsat Mercer is available here.